I had a teacher in junior high. His name was Mr. Schultz. He seemed a lot older (I’m sure he was like 45 or something at the time). He was the boys’ tennis coach, and my English teacher. I can honestly tell you, I can’t remember a thing from his class. I think we read books- but I can’t tell you which ones. I only recall that the classroom was in the front corner of the school, and there was a beige brick wall along the front of the room. Also on the front of the room? A list. A list of rules. Classroom rules. If you broke a rule, Mr. Schultz would simply say your name and “number 7”. Or “number 9” or whatever rule you broke. That means you would have to write that rule on a sheet of paper 10 times, 25 times, 100 times- whatever number of times he doled it out- and turn it in at the end of class. Somewhat genius because it was misery writing full sentences out. Also dumb, as I wasn’t paying attention to the rest of the class. Usually the default was 10 or 25. As a result, this sentence is embedded in my brain for eternity. I handily received the punishment thanks to my fondness of talking to my neighbors in class. You have to understand, I am the type of personality that holds nothing back- now. I didn’t used to be that way. 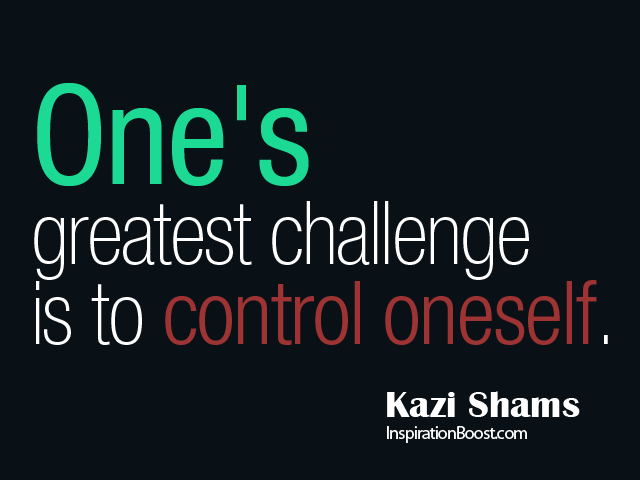 I actually exercised great self-control as a kid .Growing up I was more on the shy side. I would say college got me out of my shell and moving to LA busted down the gates of tact. So it’s a little funny to me now that I would be a disruption in class back then- during my ‘quiet’ years. I think the eventual outcome of practicing self-control is the creation of patience and respect to yourself and those around you. Self-control can be seen in our food choices. Our exercise habits. Saying ‘no’. Showing patience where others cause frustration. Being ‘the bigger person’. It can affect how far we go with our self-image and how we present ourselves to others. How far are we willing to go to make fools of ourselves to prove a point, when maybe it isn’t necessary? Sometimes restraint is much more powerful. Self-control can achieve this restraint. 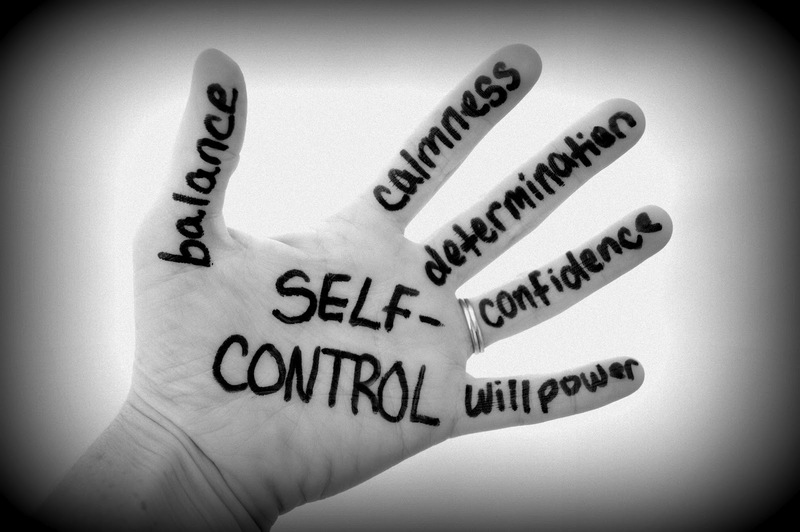 self control: noun – control or restraint of oneself or one’s actions, feelings, etc. The first part of practicing self-control is delaying your reaction. Count to ten very slowly before you react. It will take your mind off the unpleasant emotional situation and will give you some time to catch your breath. Yes, this is the first physical step in self-control—control your breathing. Breathe slowly and deep. By delaying your reaction, you break a cycle that has been an instinctual habit of yours for many years. Have a secure place where you can go and be by yourself to get your strength back. It doesn’t have to be a physical place; it can be a mental one. Use your imagination and build yourself a place where you feel safe. It’s a form of meditation to go to this place for a few minutes, be in a place that you love and feel good in; a room, the beach, the mountains, a garden. Closing your eyes and going to this place will keep you focused and will improve your productivity. Put things in perspective. How important is what just happened to your world—to the things you personally care about? Is it just a bleep on the radar that will be forgotten in no time? Why waste energy on something unimportant? Sounds a lot better than writing it out 25 times- no offense, Mr. Schultz.